Regular readers with their memories in overdrive might remember my report of last year’s Big Game, organised by our old friend Adrian and his chums from Cheltenham. That saw a glorious French defence of Leipzig, 1813, ahem. I played, by the way, Napoleon. This year, Adrian went one better and organised a very amusing campaign game, played by e-mail, which culminated in big battles on the tabletop, played out in rural Gloucestershire. I had the role of Napoleon again, ably assisted by (the sometimes querolous) Marshall ‘Alisdair’ Ney and the Royal Saxons, faithfully led by David. Against us was ranged a huge array of opponents, James, Kieron and Orhan playing the Russians and Prussians. The scenario was the Allied invasion of Germany in 1813 and Napoleon’s riposte. The email game was played out over several turns, with communication forbidden between players unless they were in the same place on the map. This led to inevitable confusion and some stress (in gaming terms), with Commanders out of touch with each other and unable to trace each other. GM Adrian provided us with amazing game reports and sketch maps. For those interested in the mechanics, a crucial aspect of the game was an initial choice of strategy. You had ten strategy points to allocate between five different aspects of the army: cavalry strength, infantry,artillery, scouting and logistics (including map movement). As Napoleon, I decided to maximise scouting and logistics with the aim of using this to get our troops into the right place to achieve local superiority. I think that in the end, it was a fair strategy, as the map movement ended with the following situation: the Russians slipped into Leipzig, with Prussians supporting from the North. More Russians were to the South, trying to reinforce their heavily pressured friends. Hot on their heels from the East were my French, Poles and Saxons. 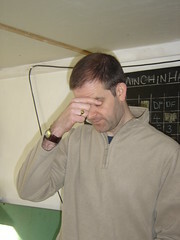 Acdrian assembled the team to play out two massive battles on a 20’ by 4’ table in the (warm and freshly painted) garden shed at Andy’s house in an obscure (but pleasant) village somewhere in South West England. As I was driven their and back by various members of the group, I never really worked out where I was. Though I think it is the cake making centre of England, judging by the vast quantities of cake and fudge provided by Andy’s wife. For his feats with the Cossacks, that consisted of holding a hill against an entire French Division, Kieron deseredly won the Hero of the Match Award. Again, poor Kieron’s Russians took a pasting, this time with the French imperial guard lending a hand. But David’s Saxons bravely held the left flank against the Russian Guard, who notoriously were lost by their Commander in the campaign game. 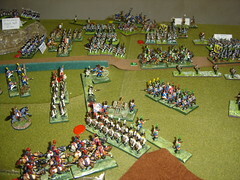 In the centre, a massive cavalry meleee, finally indecisive, but not without moments of amusement (see photos!). A good weekend, despite Adrian’s (very reasonable) ruling that the French didn’t uite do enough to win the day. By the way, we played using the shako rules, which play well and smoothly, are great fun and give a good feel. 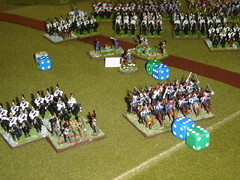 Definitely the best Napoleonic rules around. The good news though is that Adrian is already talking of another game next year. Great! Looks like a very enjoyable set of games you guys played. So all this took place in a dedicated wargames room? Hi Phil, yes it was a fun weekend and an interesting series of games, which culminated a very good campaign. We played it in a converted garage, which has been turned into a wargames room. Very nice setup. I think the weekend format gives a very different gaming experience, well worth the effort.